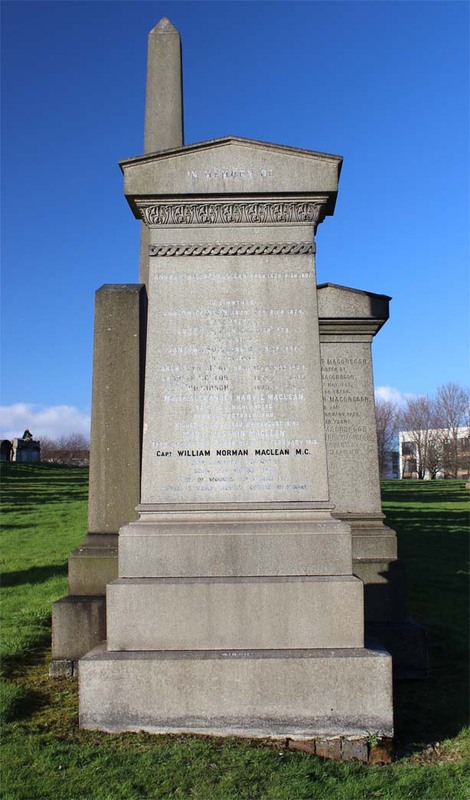 1891 Alexander Maclean joined the Argyll & Sutherland Highlanders from the Militia in January. 1897-98 He was on active service on the North-Western Frontier of India, being Brigade Provost Marshal with the Tochi Field Force, and received the medal with clasp. 1899 Promoted Captain in December. 1899-1902 Took part in the South African War, being present at operations in Natal, the defence of Ladysmith, in the Orange Free State, the Transvaal, Orange River Colony and Cape Colony, and at the actions at Lombard’s Kop and Zilikat’s Nek. For at least part of this time he was attached to the 2nd Battalion Gordon Highlanders. From July 1901, he was Commandant at Van der Merwe. For his services he was mentioned in Despatches (“London Gazette,” 10th September, 1901) received the Queen’s Medal with four clasps and the King’s Medal with two clasps. 1912 Received his Majority in May. 1914 At the outbreak of war the 2nd Battalion was stationed at Fort George. 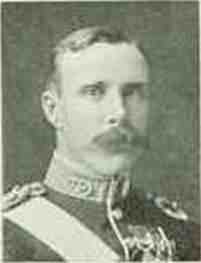 On the 9th August Maclean, commanding ‘C’ Company was the officer in charge of the third of four trains in which the battalion entrained at Fort George station. ‘C’ Company was supposed to sail from Southampton on SS Bertha on the night of Monday 10th but departure was postponed till the following day and it disembarked at Boulogne on the Tuesday evening. Things were quiet for the next ten days broken only by the requirement to attend the bearing of the coffin of General James M Grierson (buried in the Glasgow Necropolis, Primus 38) on board ship on the night of Wednesday 19th August. The Battalion’s War Diary records that ‘C’ Company was present, as were all the officers, the bearer party was made up of 8 NCOs from the battalion and the battalion’s pipers played The Flowers of the Forest. Three days later the Battalion set off for war and joined the 19th Infantry Brigade at Valenciennes. The battalion was not present at the Battle of Mons on the 23rd August but took part in the retreat to Le Cateau where it was heavily involved in the battle which occurred on the 26th. According to the battalion war diary, at 1.30pm Major Maclean led 4 platoons, drawn from ‘C’ and ‘B’ Companies, on an advance through shell fire against the German infantry. He was never seen again. Burial Le Cateau Military Cemetery, III. C. 5. After the battle at Le Cateau on the 26 August 1914 the town remained in German hands for the rest of the war and Maclean was buried in a cemetery established by the Germans in February 1916. Six other men of the Argyll and Sutherland Highlanders who all died on 26th August 1914 are also buried there. Born at Glasgow. Son of Andrew Hislop Maclean. Served in the South African Campaign. Greenwood, Shore Road, Dunoon – Alexander was not with his family. He had joined the Argyll and Sutherland Highlanders that January. Alexander Maclean was a member of the Naval and Military Club. His recreations were hunting and wild-game shooting. His youngest brother William died in 1919 as a result of wounds received in action on 5 September 1918. The Maclean family is still associated with Kelvinside Academy. There is a report in the school magazine Minerva of June 2010 of the donation of the Gymnastics Medal won by Maclean’s brother Robert in 1892/93 and a little information is given about those members of the family who attended the school.